Steven (Chicagoland, United States) on 27 December 2017 in Art & Design and Portfolio. A short-lived creation that I first undertook last year, but gave up as the Christmas season arrived too quickly. 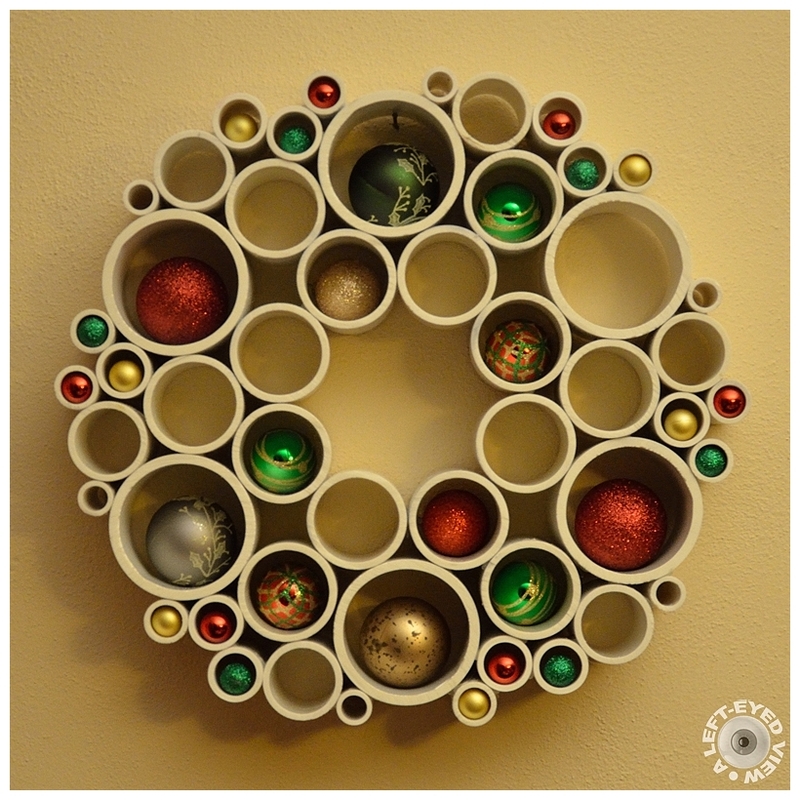 It's a wreath made up of different-sized PVC pipes that were cut in two-inch lengths. It then required me to lay out these PVC pieces around the circular base of a candle. Then using that base as a guide to create a circular form representing a wreath. After getting the form I liked, the PVC pieces were hot-glued together. Then I spray painted the wreath, but the paint (despite being made for PVC pipes) kept running and smearing, not leaving an even coat. The wreath also came apart, which boggled my mind. After that happened, I tried assembled another wreath with new pieces. But I decided against spray painting and kept it white after using acetone to get the ink print wiped off the PVC pipe pieces. After hot gluing the pieces again in a wreath shape, I then let it set overnight before reinforcing it with additional glue, given what happened the first time a week earlier. After hanging the wreath, I filled the holes with ornaments and quickly took some photos. Thankfully, I photographed this before its demise. Photo captured December 12, 2017. I hope you stick with this project for another year, Steven, because I think it's brilliant, especially if you thought it up yourself. There has to be a way to make it work the way you want. I love it! Seeing and reading this makes me feel better about my own failures . . but I can see it was fine up this point ! such beautiful frame, colors & graphics! Très original ta guirlande ! You can tie them all up by drilling holes between the pipes. Although it was an ephemeral work, the result was beautiful while it lasted. What a lot of work to end in such disappointment! It really is lovely. A very creative wreath. I hope you continue to roung out the open spots. Nice one. Quelle forme et couleur quelles belles décorations sueprbe. A wonderful creation nevertheless, and thankfully we have cameras to preserve moments. Nicely conceived, Steven ! So nice creation!!! Merry Christmas!!! :-) quite a story for this superb creation ....! Une très belle création ! Oh this is so sad! That is a really beautiful wreath and so creative. I really like it. I hope that you will try to glue it together again. Maybe try some kind of epoxy? :-) I'm so glad you captured this image before it jumped! It's a brilliant idea - I hope your next go at it will hold! The idea is great and you must try again next year. Looks fantastic Steven !! Worth all the trouble !! Thank God you took pictures ! !Lovely image !!! may be next time it will turn out okay!! So much work and finished everything on the floor, but the artistic creation was beautiful. Maybe you did not let the glue dry in a consistent way. such a long adventure for a short life masterpiece; Fortunately you took the picture before the crash! really pretty in spite of its very short life !